Help I can't find this! So I know this isn't a Fiberglass molded camper but this is the only site I like so please help! Today I was driving past a gentleman's house and saw a RV I HAVE to have!! The problem is he didn't seem to know what it is and I'm trying to figure out what I'm getting my self into before I do it! Any help would be awesome! It is an early model Winnebago. Here is what I know it has. -To the best of my knowledge it has a straight body that doesn't poke out after the driver door. -The gentleman said he thinks it's made of aluminum and steel. -It has clearance lights on the front cab. Best way to find out exactly what it is, go back, copy the VIN located on the drivers door, front drivers door pillar or lower part of wall just behind the drivers door. Google that number, get all the info you need. Sounds like a Rialta, VW drivetrain. OK, windshield is not spilt on the Rialta. Google Vixen 21. Quite rare. Now the "coolest" vintage motorhome ever? Easy. The Ultravan. 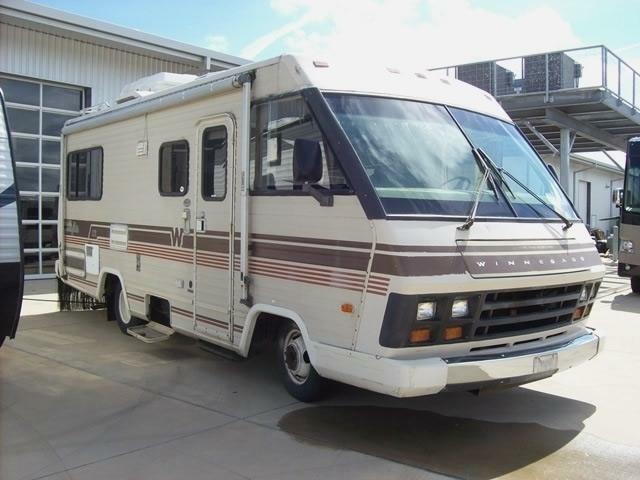 1982 Winnebago Brave with GM 6.2 diesel? Or maybe something else? It's been said "Winnebago has tried several variations, Deutz Air Diesels, GM 6.2 and 6.5 diesels and Freightliner FRED chassis over the years." I'm sure I don't recall seeing any winners using that stuff. How about a dollar and a donut? I couldn't get by it because of all the water around it. I'll need to get a picture!! A 4 cylinder even if diesel sounds like it would be something smaller than those but I have no idea. ...I couldn't get by it because of all the water around it. Without much else to go on I'll take a bling stab at this and say you might have seen a Clark Cortez. Search for images.